Food parcels have been donated to homeless people who have been hit hard by the recent cold weather. Staff from Northampton Borough Council and Northamptonshire County Council and hospital donated items to Exeter Place community centre in the town. As part of the Severe Winter Weather Scheme, emergency support is offered when the temperature remains below 0C for three consecutive days. 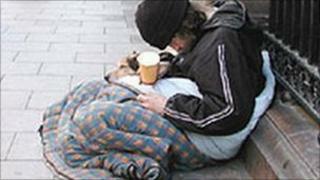 A rough sleepers helpline has also been set up operating every day of the year. Sally Beardsworth from Northampton Borough Council said: "It's heart-warming to see so many people go out of their way to donate food supplies to people sleeping rough in this cold weather. "Providing a warm meal and a hot drink may seem like a simple task, but it could be the difference between life and death." When the Severe Winter Weather Scheme is operating, homeless people can come to the Exeter Place community centre between 2130 GMT and 1000 GMT to be given emergency accommodation, heating, bedding and food. When the weather improves, Northampton Borough Council said it aimed to help those people find homes or other assistance they need.